The SOLO Taxonomy’s power is in its simplicity. After 6months of implementing it into what we do in Quest (Year 8 integrated Science and Geography) I had a conversation with two year 12 Biology students about how they could improve their written response to HSC questions and released that I was seamlessly describing how they had connected ideas, but they had not extended as the question had ask. I was explaining this with the simple hand gestures that describe SOLO and realised I had assimilated SOLO into the way I was thinking to the point it was flowing naturally out of me, and what surprised me most was the students grasped what I was saying instantly. When I first started exploring SOLO Taxonomy I was confused by the terminology and I came to it with the mindset of the complexity of Bloom’s Taxonomy. I have been a Bloom’s devotee, I believe much of what we have had students doing for so long was low level and not challenging. Blooms gave some structure to help improve the depth of tasks but I have found Blooms relies on a deep understanding of the verbs used and that often leeds to confusion. Blooms lacks an underlying framework of what happens when we think and learn. SOLO on the other hand in its very nature of looking for observably thinking provides the framework that the learning verbs attach to. My first steps in introducing SOLO into the lesson preparation for Quest was to describe the SOLO Taxonomy to the team of teachers I work with and create a template using the SOLO symbols that we expected all tasks to aline to (see the image for an example of how it was implemented). We started by only using the last three levels of SOLO (Multistructural, Connected and Extended abstract) in our scaffold and allowed teachers the flexibility of not including all levels if they felt the task could not be pushed into the higher thinking levels. We made extensive use of Pam Hook’s HookED site and the useful tools she makes available. It was stressed that we really wanted the extended tasks to push the students thinking and that they could be seen as ‘extension’ tasks for the brighter students. In practice I have found that treating these tasks as optional for students or telling capable students to start with the extended tasks has been a helpful differentiation tool for a mix ability class. What should learning look like? I currently have responsibility for a team of teachers implementing an integrated (science & geography) year 8 course. A large part of the learning that occurs in this course occurs in an open learning space with up to five classes being present at any one time. Our school has a bring your own device policy (BYOD) and all of the learning tasks are available via the online learning portal. Two question that I have been contemplating as we reprogram this year are what is “the role of the teacher?” and “what should learning tasks look like?” These two questions are interrelated, both effect the other. Neither can be properly answered without a clear idea about what learning should look like. The role of the teacher in one sense has never changed, that is the teacher is the guide for the learner. Expert teachers have always been a guide, but many have also acted as the font of knowledge that was poured into empty minds. But students don’t come with empty minds and they lose attention after 7 to 10 minutes of teacher talk. Having all our learning online allowed some teachers to go too far in another direction, allowing students to just get on with it and stepping so far back that they became absent in the minds of some students. This is not new either, it’s just the teacher who set work in a text and left the room. Good teachers are active in the learning of their students. To be active they need to know ‘the what next’ for each learner. To know the what next, teachers need to have obtained feedback from the learner about what they already know, what is their current understanding or misunderstanding and how big a next step the learner is capable of taking. Teachers need to be good at building relationships with students to build the trust that allows for the honest feedback from student to teacher to occur. How then do you build tasks that help facilitate teachers to be active participants learning? One answer that I have found useful is one in which a common language of learning is developed around obtaining a deep understanding of a concept. SOLO Taxonomy is a common language for learning. SOLO Taxonomy helps both students and teachers identify ‘the what next.‘ It is based on the science of how we actually learn and is simple enough that it does not get in the way of learning. SOLO is about understanding, connecting and then extending ideas. It allows both teacher and student to quickly assess what stage they are at and identify what the next step is. SOLO stands for Structured of Observed Learning Outcomes and was proposed by Australians Biggs and Collis (1982). I will not go over what it is here but will direct you elsewhere. The best source of information on SOLO and its implementation is Pam Hook @arti_choke via her books and website HookED. I have also benefited from reading about the experiences of others including Chris Keipert @keipertc and his blog Chemisty Chris. Finally checkout GlobalSOLO @globalsolo for some great ideas about how SOLO is being implemented. Biggs, J.B., and Collis, K.F. (1982) Evaluating the Quality of Learning-the SOLO Taxonomy (1st ed) New York: Academic Press. I have been fortunate to attend the inaugural Big History and the Future of Education Conference, organised by the Big History Institute at Macquarie University, Sydney Australia. I knew a little of the Big History story and had been looking into the student course. If its new to you have a look at the Big History course ( Big History Project ) it’s free and be aware there is a school version and a general public version. At my current school we teach an integrated year 8 Science and Geography unit called Quest. I attended the conference looking for ideas about how to better integrate learning from different KLAs and I was hoping for some insight into the pedagogy that had been applied in creating the course as well as the process of designing the online learning pages and activities. My questions were answered beyond my expectations and I left with some key principles that can be applied universally in education. I also came away inspired to implement the Big History program within a school context and my head is spinning with ideas about how that might be achieved. Frame Problems for investigations – regularly question at many scales, including the biggest. The Big History course site is beautiful, but part of its beauty is that there are clear design principles at work. The site is designed to be intuitive and easily navigated. The site remembers that you need to see the big picture before diving into individual elements. These principles struck me as they were the same ideas that the team I work with at school had been discussing as we reshaped our year 8 integrated studies online learning pages. The launch pages show the big picture, it is simple and easy to navigate. There are clear learning modules, that include easily identified components, content, video, activity etc. There is a narrative that ties everything together and this is made implicit. Everything is driven forward (at every stage/level) by questions. Implementation of Big History in a school. How should Big History be implemented? At this stage I will only be able to talk in ideals. Every school is different, with different cultures, daily routines, community support, personnel …. the list is endless. What is encouraging about what is present i the Big History course is the built-in flexibility and the ease with which learning can be modified for individual students. Everything comes in a Word document that can be edited, it is designed to be adapted into different contexts and there is an active and growing community of educators contactable within the Big History course. Ideally, I think Big History needs to be introduced as a core subject/course. In Australia it covers a significant amount of the Australian Curriculum (in Science, History and Geography) and it would pain me if this was taught twice within the school. As this is an integrated course, I think it should be taught collaboratively in a team teaching situation with specialist teachers from both Science and History. The best cases of implementation on display at the conference were from schools that took a collaborative teaching approach. If we are going to break down the artificial walls that separate and compartmentalise learning into separate subjects why not take out some of the physical barriers too. Ideally I would run this course in year 9, the outcomes currently addressed link to Stage 5 in NSW, Australia. As a solution to timetabling issues I see two classes and two teachers occupying the same (large) space. Taking big chunks of curriculum from subjects will mean a need for reprogramming of what is left, and maybe an opportunity for some other integrated courses to be developed in the process. For a while the idea of allowing students time to play and explore with equipment or other experimental setups has been an informal part of the learning in my classrooms. One place I have been doing this since I started teaching is with microscopes. The wonder of microscopes for me has always been seeing the amazing microscopic world around us. Yet, there is nothing more boring than a prepared slide of cork cells. While a water sample from a nearby creek or pond can keep students exploring for hours, as they chase protozoa and other microbes around a slide and in the process gain the fluency of microscopy skills required to go deeper. More recently I have been trying to be more deliberate in designing learning that involves this element of playful experimentation. One way I have found helps with the planning is to add an extra P (play) to the POE (predict, observe, explain) lesson sequence. 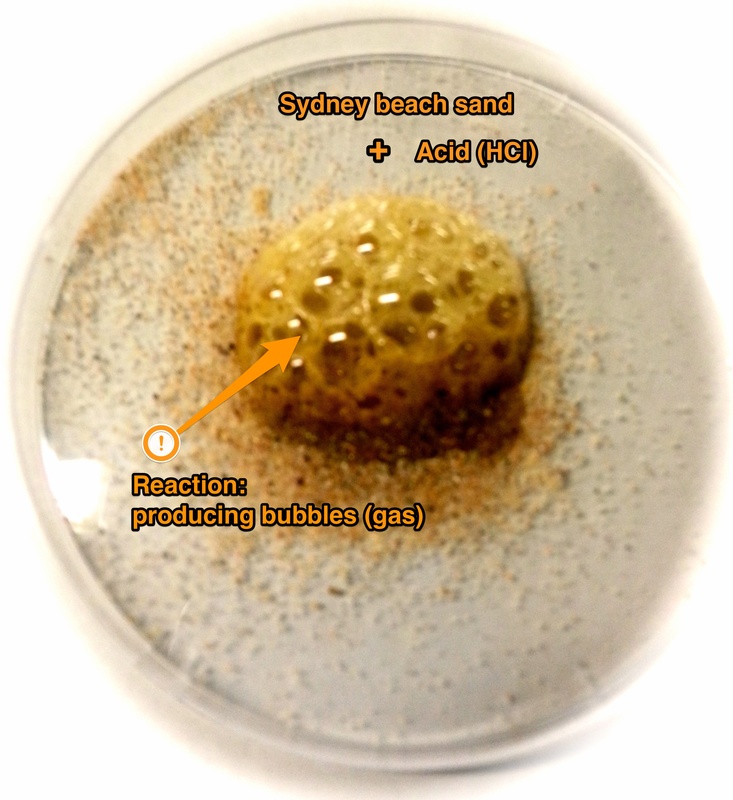 An example of such a lesson is the comparative reaction of sand from Sydney beaches to that of sand from Sydney sandstone with acid (HCl). The beach sand reacts producing bubbles, while the sandstone sand doesn’t. I gave the necessary equipment (sand and acid ) to my year 9 science class and with some basic instruction asked them to first predict what would happen and then explore with the reactions of the different sands and acid. I then gave them microscopes to have a closer look at the sand and asked them to explain the obvious difference in reactions. It was not until some of the students decided to carry out the reaction under the microscope that they spotted the difference between the sands. There are obvious particles present in the beach sand that react while there are others obviously not reacting. And at this point, with the curiosity of the students at its highest, I stepped in with some explicit teaching of reactions between acid and carbonates (shell bits) and the lack of carbonates in Sydney sandstone. We were studying some geology and the learning outcome was about what we can infer about the history and formation of rocks and past environments and not so much the chemistry involved. The hands on problem solving lead to students producing a much better explanation of the differences and a much deeper understanding of the geology involved. A final reflection is that the playing, predicting and observation do not have to be sequential and that in fact they can occur simultaneously or even in reverse order as observations can lead to new predictions and new play. Recently I was asked to describe a lesson that demonstrated deep learning of my students. The first thing that jumped into my mind was my Year 9 class that is full of students that ask lots of questions. dents already understand and what they want to know next. 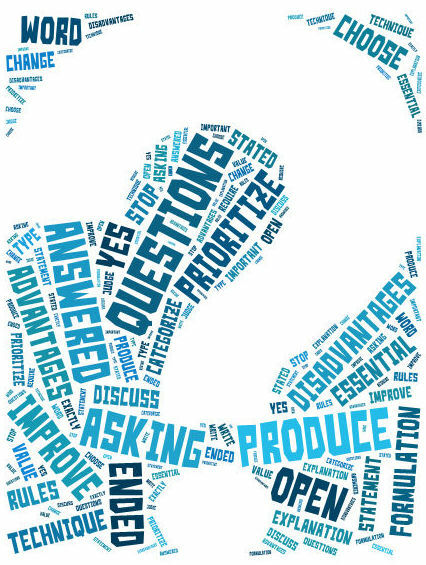 Follow up questions are often produced that take the discussion deeper into the learning. In reflection this is my favourite part of teaching, helping students engage with their own curiosity and the production of questions that can drive learning. 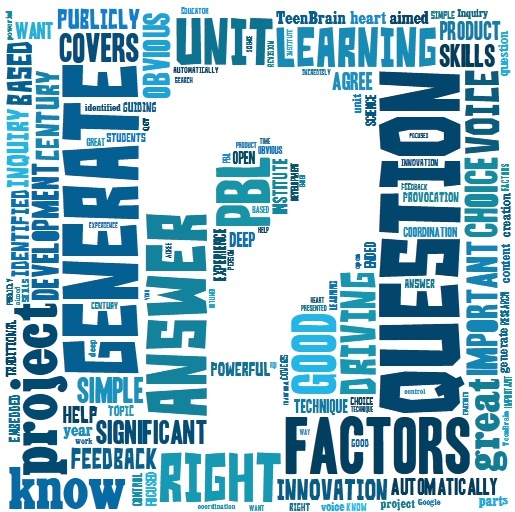 What makes good questions possible in a classroom? It comes back to developing good relations with the students. You need to feel ‘safe’ to ask questions, you need to know you will not be ridiculed for asking any question. All questions need to be valued. And if the teacher knows his/her students it’s easy to provide a stimulus that is of interest to the students that provokes them to start asking questions. An article, ‘Summer of hard knocks puts teens at risk‘ in the Sydney Morning Herald (SMH, 2013) reports on the increase of injuries due to the skateboard and scooter accidents and the need to wear helmets. The article suggests that the best way to get teens to wear helmets is for them to educate each other of the importance. The article had me reflecting on a recently completed unit on physics with my year 9 students. This unit followed on from a unit spending time developing student questions about the brain, its development and teenage decision processes. The physics unit includes Newtons laws of motion which screams out to be understood in the light of current enthusiasm for skateboarding, scooter riding, BMX, mountain biking and stunt riding. All of which have the potential for brain injuries. Thus in this unit (an inquiry / project based learning investigation) students were asked to apply Newtons laws of motion to helmet design and answer the question, how does a helmet protect your head? They were guided through the running of an investigation to test a helmet they had designed. To model the human brain we used water filled balloons. Adding some validity other questions posed to students included: How can you make your model of the human brain as realistic as possible? What is the mass of an average human brain? How much water would need to be in the balloon? After setting the scene with some videos on the need for helmets and the issues related to brain injuries as well as conducting an initial test dropping an unprotected water filled balloon at 1m(bounced and survived) and 2m(burst on impact) I was mostly hands off, taking on the role of co-learner. I did incorporate some direct teaching of Newtons laws as the need for them arose. 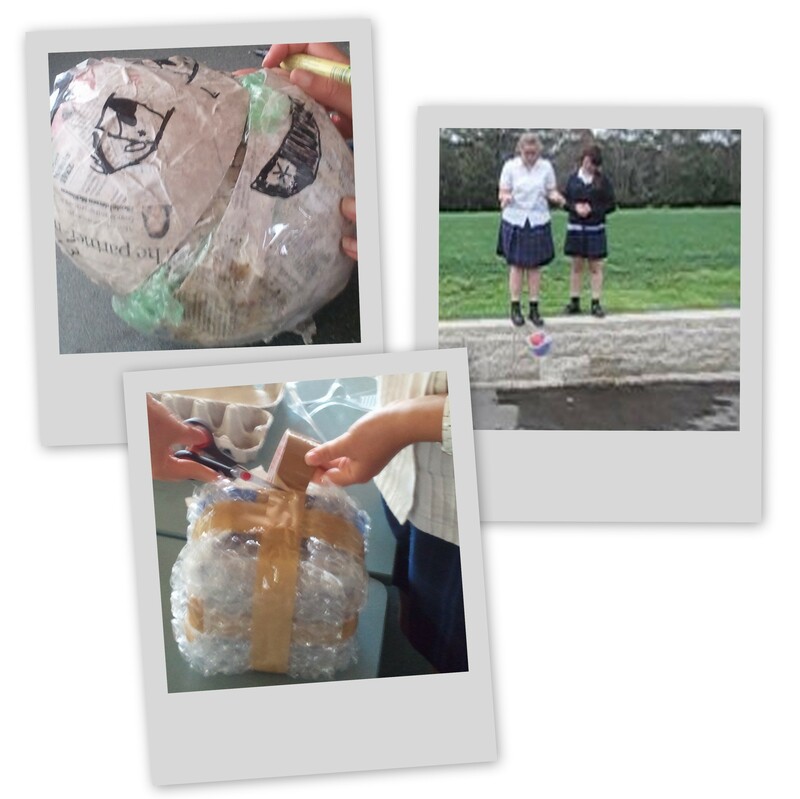 We had a couple of lessons on research and design, students had to choice building materials from a limited school supplied list (egg cartons, cotton wool, bubble wrap and ice-cream containers) or they were free to source and supply their own alternatives. The students took several different approaches to designing their helmets and we tested them in drop tests of 1m, 2m, 4m and 8m. Only a couple of ‘balloon brains’ survived 8m in their helmets. Some thoughts for next time. What worked well was giving students independence to come up with their own solutions. The construction and testing were highly motivational. One issues that we did not fully resolve was how to fill the balloon to exactly the same amount in a controlled way. Also I filmed the helmet-balloon drops with the thought of analysing the motion and forces, but ran out of time to find a software solution for students to use, something I hoped to resolve over my summer vacation. Finally after reading the newspaper article I realised that we missed an important step of any project based learning activity, that of reporting to an authentic audience. In this case their peers. The Sydney Morning Herald (2013) Summer of hard knocks puts teens at risk. [online] Available at: http://www.smh.com.au/national/health/summer-of-hard-knocks-puts-teens-at-risk-20130112-2cmha.html [Accessed: 13 Jan 2013].